Sainted Jona, Metropolitan of Moscow and WonderWorker of All Russia, was born in the city of Galich into a pious Christian family. The father of the future saint was named Feodor. At twelve years of age the youth took monastic vows in one of the Galich monasteries, from which he transferred to the Moscow Simonov monastery, where for many years he fulfilled various obediences. One time Sainted Photii, Metropolitan of Moscow (Comm. 27 May and 2 July), visited at the Simonov monastery and after the molieben, having blessed the archimandrite and brethren, wanted also to bless the monks fulfilling obedience at the monastery tasks. When he came to the bakery, he saw then the monk Jona asleep from much work, and the right hand of the fatigued monk was bent in a gesture of blessing. Sainted Photii asked not to wake him; he blessed the sleeping monk and prophetically predicted to those present, that this monk would be a great hierarch of the Russian Church and would guide many on the way to salvation. The prediction of the Saint was fulfilled. After several years Saint Jona was made bishop of Ryazan and Murom. In 1431 Saint Photii died. Five years after his death, Saint Jona was chosen Metropolitan of All Russia for his virtuous and holy life. When the newly chosen metropolitan journeyed to Patriarch Joseph II (1416-1439) in Constantinople, in order to accept confirmation as metropolitan, it turned out then, that shortly before this the nefarious Isidor, a Bulgarian by descent, was already established as Russian metropolitan. Spending a short while at Kiev and Moscow, Isidor journeyed to the Council of Florence (1438), – where he accepted Uniatism. A Sobor / Council of Russian hierarchs and clergy deposed metropolitan Isidor, and he was compelled to flee secretly to Rome (where he died in 1462). 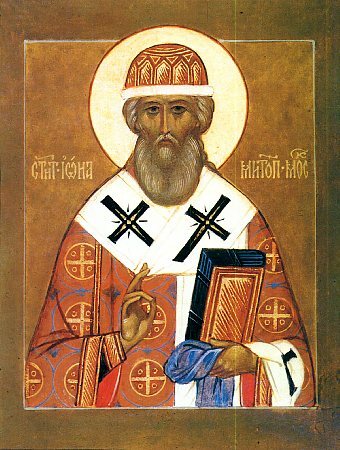 Saint Jona was unanimously chosen Metropolitan of All Russia. His consecration by the blessing of the Constantinople Patriarch Gregory III (1445-1450) – was the first time that it was done by Russian hierarchs in Moscow. On 15 December 1448 Saint Jona became Metropolitan and with arch-pastoral zeal he began to assert piety among the flock, encouraging the Orthodox faith in the land by word and by deed. And beneathe his exalted dignity he continued as before with his personal monastic efforts. In 1451 the Tatars unexpectedly advanced on Moscow; they burned the surroundings and prepared for an assault on the city. Metropolitan Jona with clergy made procession along the walls of the city, with tears beseeching God for the salvation of city and people. Beholding the dying monk Antonii of the Chudov monastery, – who was noted for his virtuous life, Saint Jona said: "My son and brother Antonii! Pray to the Merciful God and the All-Pure Mother of God for the deliverance of the city and all Orthodox Christians". The humble Antonii replied: "Great hierarch! We give thanks to God and His All-Pure Mother, – She hath heard thy prayer and hath besought Her Son, – the city and all Orthodox Christians wilt be saved through thine prayers. The enemy will soon take flight. Only I alone am destined by the Lord to be killed by the enemies". Just as the elder said this, an enemy arrow struck him. The prediction of Starets Antonii occurred: on 2 July, on the feast of the Placing of the Robe of the MostHoly Mother of God, confusion broke out in the ranks of the Tatars, and in unexplained fear and terror they turned to flight. Saint Jona built in his courtyard a temple in honour of the Placing of the Robe of the MostHoly Mother of God , – in memory of the deliverance of Moscow from the enemies. The blessed end of Saint Jona followed in the year 1461. By the grave of the Saint began to occur numerous healings. In 1472 the relics of holy Metropolitan Jona were opened undecayed and placed in the Uspensky Sobor / Cathedral of the Kremlin (the feast of Transfer of the holy Relics is celebrated 27 May). A Sobor of the Russian Church in 1547 established the individual day of memory to Sainted Jona, Metropolitan of Moscow. In 1596 Patriarch Job established the celebration to Sainted Jona in the Sobor / Assemblage of other Moscow Hierarchs, on 5 October.